Fr. 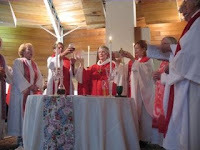 Roy Bourgeois holds cup at Janice Sevre Duszynska's ordination. Now male priests, bishops and a cardinal are supporting his stance for gender justice in the church and some are advocating for women priests. Published: Friday, July 22, 2011 at 6:30 a.m.
"More than 150 Roman Catholic priests in the United States have signed a statement in support of a fellow cleric who faces dismissal for participating in a ceremony that purported to ordain a woman as a priest, in defiance of church teaching. We are at the beginning of a tipping point. Now rank and file priests are saying "Enough" of sexism in our church. There is a growing enthusiasm for women priests in the Catholic Church- now the male priests are jumping on the bandwagon of support for gender justice. So are some bishops and a cardinal! "In an unprecedented move, 157 Catholic priests have signed on to a letter in support of their fellow embattled priest, Fr. Roy Bourgeois, who has been told to recant his support for women's ordination or be removed from the priesthood. The letter that supports Roy's priesthood and his right to conscience was delivered, Friday, July 22nd, to Fr. Edward Dougherty, Superior General of the Maryknoll Fathers and Brothers in Maryknoll, NY. "We can no longer remain silent while priests and even bishops are removed from their posts simply because they choose to speak their truth," said Fr. Fred Daley, a spokesperson of the effort and a priest of the Syracuse Diocese. "Together, we are standing up for our brother priest, Roy, and for all clergy who have felt afraid to speak up on matters of conscience. "We hope that our support as ordained priests in good standing will help give Fr. Dougherty the support he needs to make a decision that is fair and just." This stance of priests from the United States follows a series of recent actions where priests collectively have taken a stand for justice in the Church. Last year, priests in Ireland formed a union aimed at organizing the 6,500 priests there in response to the clergy abuse crisis. In May of this year, the National Council of Priests of Australia released a statement in support of a bishop forced to resign because he mentioned women's ordination as one possible solution to the priest shortage. Then, this month, the Austrian-based Initiative of Parish Priests launched a campaign with 300 priests signing a call for resistance that encourages, among other things, the inclusion of women and married men to the priesthood..."
Women priests denied the pulpit are in the forefront, and backed by some strong advocates. Hushon added that the “movement is getting larger and larger” and he predicts that it will soon reach a critical mass at which point huge gains will be made. “We could see some very interesting things as acts of resistance. We could see two weeks in a row significant numbers of people who don’t give anything in the collection bowl. We could see two or three weeks in a row at the end of this year where nobody shows up to give communion. Or nobody shows up to read. Or nobody shows up to teach,” he said. The movement’s leverage will continue to grow along with its numbers, inspiring bigger and bolder attempts to challenge the status quo. Congratulations to John Hushon and the American Catholic Council Conference for their work for renewal in the Catholic Church. Let us be the change that we profess to be as we transform our beloved church. Mary, Mother of Jesus Catholic Community's leadership Circle was present in Detroit. The Associaiton of Roman Catholic Women Priests were present too! This is a brief update on Good Shepherd Ministries for our supporters. The first paragraph describes the joy of this summer with our young people. The second describes the near disaster that was averted this week. For the blessings of this summer, may God be praised. This was an active summer as we had eight days of working with our young people even as our nucleus of 30-40 worshippers continued to celebrate with us regularly. Six of these days were a part of our formal Vacation Bible School and two were special field trips. Each day was full of blessings. We served twelve children ranging in age from 4 -15. All were from very low income households. We gave small stipends to the two fifteen year olds as "junior leaders". Two parents worked with us and also earned small stipends as my Assistants. Our wonderful regular Sunday School Associate Teacher, Efe Cudjoe,17, who will be attending Brown University in the Fall was able to be with us for a number of the Camp days. (Efe is bottom right in the planting photo).And Hank Tessandori and Harry Gary assisted with activities and transportation. Our kids learned a great deal more about God's love by experiencing it. They are also more competent in reading, understanding and knowing the Bible. And they loved exploring Creation, especially planting the garden and being at the beach with the tiny sea creatures. Most importantly they grew in their relationships with Christ and loving one another. At the end of the Camp three people requested to be baptized. Two were teens 13 1nd 15 and one was a parent. Wow! (I am attaching a few VBS pictures). A few days ago we had a near disaster at the house church. The Air Conditioner ( a reconditioned Unit that we had for only one year) literally blew up and emitted fire and smoke. Fortunately one of the men, Joe, who lives in Joshua House heard the noise, saw the fire and smoke and called us right away. He then turned the breaker off thereby averting more fire. Yesterday we replaced the Unit that was completely burnt out and learned that if Joe had not acted so quickly the house could have burned down. We were told that it completely lacked safety devices that are usually installed. We thank God that this disaster was averted. The cost of the new Air Conditioner was $5000. The labor was donated by the company and they were careful to install all safety devices up to code. Needless to say we are now praying for donations to help with this major cost. We break even on a monthly basis due to our wonderful regular supporters and one time gifts. We are hoping that hearts will open to help us pay this bill and enable our work to continue. If Mary of Magdala was walking the earth today, she would be confronting Peter and the male disciples for full equality of women. In Pistis Sophia, an early document, Mary of Magdala, acclaimed by the Church as Apostle to the Apostles, took a proactive role asking questions and giving interpretations of the Risen Savior's message. When Peter complained about Mary's prominent role, she responded that he hated the female race! The full equality of women includes women priests and women bishops, (not just women deacons) ordained in apostolic succession in the same way as men.It is an issue of justice that even some in the hierarchy are embracing now. See articles below and movie citing bishops and a cardinal who have come on board. Let us not settle for advocating for the diaconate. The charism/gift of Roman Catholic Women Priests Movement to the Church is a renewed priestly ministry in a community of equals! Kudos to Future Church for its dedication to the educational task of restoring women's history/HERSTORY and to advancing the cause of women in ministry. CLEVELAND, OHIIO: Hundreds of Catholic organizers around the world are calling for an end to the silencing women on the feast day of St. Mary of Magdala, the first witness the Resurrection. At present, women's voices are silenced in Catholic churches. Stories of female biblical leaders are omitted or made optional in our lectionary and women, indeed all lay people, have recently been forbidden to preach at Mass even though canon law allows it. The focal point of the celebrations will be “unheard homilies” given by women who refused to be silenced. They will preach the homilies they have longed to preach at Mass if they were only permitted- without restraint and without fear of criticism. Their perspectives as women and mothers living the Gospel in a secular world will give new life and meaning to Catholic women and men trying to relate the scriptures to their lived experience. The prayer services organized around St. Mary of Magdala’s July 22 feast day also call upon the voices of women who have been silenced throughout our history- beginning with St. Mary of Magdala, through the women leaders in the early Church, to medieval times, and today. These voices will inspire their listeners to end the silencing and honor the contributions of women in our personal and institutional faith journeys. As part of their commitment to end the silencing of Catholic women, participants at St. Mary of Magdala celebrations across the nation will be sending paper and electronic postcards to Cardinal William Levada, Prefect Congregation for the Doctrine of the Faith, as well as their local bishops. The postcards ask Church leaders to restore the tradition of women deacons in the Catholic Church. Restoring the female diaconate allows women to preach a homily at Mass, thus diminishing the silencing of Catholic women of the Word. Their perspectives as women and mothers living the Gospel in a secular world will give new life and meaning to Catholic women and men trying to relate the scriptures to their lived experience. For more information about women deacons and the FutureChurch campaign, go to http://futurechurch.org/watw/womendeacons/. St. Mary of Magdala was a foremost leader in the early Church, led the group of women who accompanied Jesus at his death, and first proclaimed the good news of his Resurrection. She was not a prostitute as some believe,” said Emily Holtel-Hoag, FutureChurch Special Projects Coordinator. “For centuries St. Mary of Magdala’s story, like those of the women leaders in early Christianity, has been minimized or excised from the official Lectionary used in both Catholic and Protestant churches as well as Catholic Church history textbooks,” said Sr. Christine Schenk, Executive Director of FutureChurch. In 2008 FutureChurch led an education and advocacy effort to raise awareness at the International Synod on the Word in Rome about the invisibility of women's biblical leadership and experience in Church preaching and scripture proclamation. The synod outcomes were heartening. Not only did the most women scholars in history attend, but two final synod propositions specifically addressed FutureChurch’s requests. Proposition 17 on “Women and the Ministry of the Word” is a gracious affirmation by the universal Church of women leaders who animate faith communities and preside at services of the Word all over the world. Proposition 16, suggesting a reexamination of the lectionary, was a most welcome surprise. 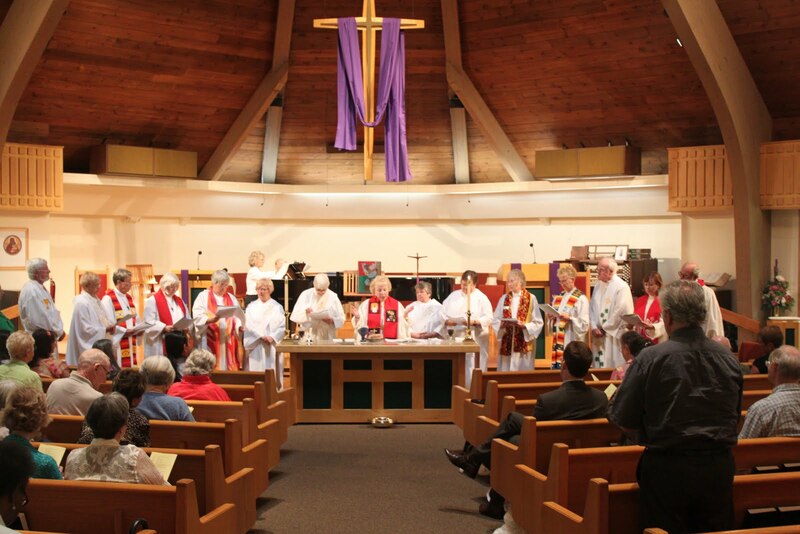 Many doubted that the synod would open the lectionary discussion. To educate about women leaders and to model gender balance in scripture proclamation, FutureChurch began special international celebrations of the Feast of St. Mary of Magdala in 1997. Each year approximately 300 such events are held in mid July. Participants hear presentations by biblical scholars about early women leaders and experience prayer services at which competently prepared women preach and preside. “One of the reasons the Mary of Magdala celebrations have proved so enduring is that Catholic women and men are edified to discover that Jesus included women in his Galilean discipleship. Most Catholics mistakenly believe that Jesus called only men, when in fact Luke 8:1-3 tells us Mary of Magdala, Joanna, Susanna and many other women accompanied him in Galilee. The celebrations this year will provide further knowledge that Jesus’ inclusive ministry was modeled in the early centuries of Christianity,” said Schenk. Catch the Growing Wave of Enthusiasm for Women Priests in the Catholic Church. Now male priests, bishops, theologians, even a Cardinal is Supportive! "Kathy Kelly, an internationally known peace activist, drew concentric circles on the chalkboard. The outermost circle represented U.S. citizens thoroughly antagonistic toward aims and strategies of the peace movement. In the next circle were people apathetic about wars the United States is waging. In the next circle were citizens whose opinions could be swayed, followed by a circle representing the organizers willing to engage in setting up education and outreach actions. The innermost and smallest circle represented those who risk imprisonment for non-violent direct actions or risk their lives by traveling as peacemakers into war zones. Kelly suggested that the circle most important to expand is that of the organizers, those who maintain databases, write press releases, arrange speaking events, organize phone banks and accomplish all the tasks necessary to broaden outreach and education. “How do we make this part of the circle grow?” she asked. Kelly suggested that many people possess excellent organizing skills but are consumed with arranging sports and entertainment events for their children, e.g. soccer games. “Can we appeal to the parents’ natural empathy for children and encourage stronger involvement with peace and environmental activism that will build a better future for their children?” she asked. Peacemakers from all over the United States gathered last year during the July 4 weekend in Oak Ridge, Tenn., for the 30th anniversary of Plowshares, The Nuclear Resister and Oak Ridge Environmental Peace Alliance. Kelly suggested engaging people in the anti-nuclear and anti-war movement by seeking common ground. In 1988 Kelly was sentenced to a year in prison for planting corn on nuclear-missile silo sites. She served nine months in a maximum-security prison in Lexington, Ky. In spring 2004 she served three months at Pekin Federal Prison for crossing the line as part of an ongoing effort by School of the Americas Watch to close the combat training school at Fort Benning, Ga.
Kelly went on to help found Voices in the Wilderness, a campaign to end the U.N. and U.S. sanctions against Iraq. For taking medicine to Iraq in open violation of the sanctions, she and other campaign members were notified of a proposed $163,000 penalty. They were threatened with 12 years in prison and eventually fined $20,000 – a sum that they’ve refused to pay. Later they renamed the organization Voices of Creative Nonviolence. Voices in the Wilderness organized 70 delegations to visit Iraq during the period between 1991 and the beginning of the “Operation Shock and Awe” warfare, which began in 2003. Kelly had visited Iraq 24 times since 1996. In October 2002, Voices of the Wilderness declared its intent to remain in Baghdad, alongside Iraqi civilians, throughout a war they thought they could still prevent. Kelly and her team stayed in Baghdad throughout the bombardment and invasion and maintained a household in Baghdad until March 2004. During the first two weeks of the Gulf War, she was part of the Gulf Peace Team, a peace encampment on the Iraqi-Saudi border. Following evacuation to Amman, Jordan, on Feb. 4, 1991, team members stayed in the region for the next six months to help coordinate medical relief convoys and study teams. Other Lands Have Dreams: From Baghdad to Pekin Prison, published in 2005, is Kelly’s account of her time in Iraq from the first Gulf War of 1991 through the misery of 12 years of economic sanctions to the U.S. invasion and occupation of Iraq that began with Operation Shock and Awe and continues to the present. “Something that we often said in Iraq was, ‘Where you stand determines what you see.’ We didn’t see ourselves as human shields, but we wanted to stand alongside people and try to understand the war from the perspective of people who are in front of the gun or caught in the crosshairs,” Kelly said. “But, of course, one reality is we had our European passport and could leave, whether it’s Gaza or Iraq or Afghanistan or Pakistan. They have nowhere to leave. We thought we could amplify the voices of the people whose concerns are often unrepresented or overlooked. In 2007 Voices for Creative Nonviolence launched the Occupation Project, a campaign of sustained non-violent civil disobedience aimed at ending funding for the U.S. war in and occupation of Iraq. CODEPINK, Declaration of Peace, Veterans for Peace and other national organizations joined in organizing the campaign. Between Feb. 5 and April 17, 2007, over 320 arrests occurred in the offices of 39 representatives and senators. The campaign spread nationally, with campaigns in over 25 states from Portland, Maine, to Portland, Ore., and from Fairbanks, Alaska to Huntsville, Ala. The goal of the campaign was to encourage representatives and senators to commit to voting against any funding for the Iraq War. Voices members aimed to non-violently occupy the offices of elected officials who persisted in voting to fund ongoing war. In 2007 she spent five months in Amman, Jordan, living among Iraqis who had fled their homes and were seeking resettlement. She visited Gaza during Israel’s “Operation Cast Lead” assault in 2009 and spent a month in Pakistan in 2009, writing eyewitness accounts of war’s impact on civilians. Kelly traveled to Pakistan once and to Afghanistan three times in 2010, with small delegations intent on learning more about conditions faced by ordinary people in these countries affected by of warfare. This spring she and two dozen peace activists visited Afghanistan, where they worked closely with the Afghan Youth Peace Volunteers in search of non-military solutions to end the war. Kelly spoke of how a journalist recently called to talk about news that the United States had killed Osama Bin Laden. Referring to throngs of young people celebrating outside the White House, the reporter asked what Voices would say if it had a chance to speak with those young people. “We’d want to tell them about a group of people who in November of 2001 walked from Washington, D.C., to New York City carrying a banner that said, ‘Our Grief is not a Cry for War.’ Several of the walkers had lost their loved ones in the attacks on 9/11. When the walk ended, they founded Families for Peaceful Tomorrows to continually represent the belief that our security is not founded in violence and revenge. Kelly recounted a 2010 Voices delegation that visited a rural village in the central highlands of Afghanistan. They sat with women who were close in age to the young people who were celebrating at the White House when Bin Laden was killed. Asked if they had ever heard of a time when a large passenger plane had crashed into a tall building in the United States, the young women were puzzled. They had never heard of 9/11. "LIKE a Crusader heading off to pagan lands to fight the Infidel, Taoiseach Enda Kenny has embarked on an all-out battle against the heinous evil of protected clerical paedophilia in the Vatican citadel which he must not lose.Unlike his predecessors in the office of Taoiseach, he is not rallying to the cause of the Papal Flag. He is taking on the Vicar of Christ and Supreme Pontiff under the banner of 'Children First'. Whether wittingly in full knowledge of the likely consequences of his historic challenge to Roman supremacy, or merely playing to the gallery, the man from Mayo, literally, yesterday crossed a Rubicon of no return. The Taoiseach's fiery speech during the Dail debate on the report of the Commission of Investigation into the Catholic Diocese of Cloyne marked him out from the deferential Ireland of WT Cosgrave and Eamon de Valera, and more notably, from the "Do-nothing Ireland" of Brian Cowen.Moving the motion of censure as a cradle Catholic, but also as father of a young family, Mr Kenny was relentlessly savage in his verbal onslaught against the Vatican of Pope Benedict XVI. Speaking at "an unprecedented juncture" in traditionally chummy Vatican-Ireland relations, Enda, the democratic revolutionist elevated Cloyne to a different order from the Ferns, Ryan and Murphy reports.He did so because "for the first time in Ireland, a report into child sexual abuse exposes an attempt by the Holy See to frustrate an inquiry in a sovereign, democratic republic . . . as little as three years ago, not three decades ago"...."
Ordination of four deacons in Sarasota, Fl. Fr. Roy's excommunication by Vatican. Catch the growing wave of enthusiasm for women priests in the Catholic Church. Now male priests, bishops, theologians, even a cardinal are joining the enthusiastic chorus of support by challenging the Vatican's prohibition on women's ordination. They are following in the footsteps of Maryknoll Roy Bourgeois whose prophetic call for a dialogue on women priests is being heard in our church today. Nothing can stop the movement of the spirit toward human rights, justice and equality in our world and in our church. Join the movement for justice for women in the Catholic Church! The Association of Roman Catholic Women Priests is a stream of the international Roman Catholic Women Priests Movement that began on the Danube River with the ordination of seven women in 2002. We are in the United States and Latin America. In order to claim equality for women in the church women priests are ordained in apostolic succession in the same way as men. -We use equal rites to promote equal rights to achieve justice for women in the church. 1.We seek justice for women in the church including ordination and justice for all. 2. We serve the poor and marginalized. 3. We live the spiritual and social justice tradition of the church in inclusive communities of equals. In spite of the Vatican's effort to punish women priests, our movement is flourishing.Drenched in the Spirit's prophetic imagination, grassroots communities are springing up led by women and men priests and empowered people. Now, we have reached a tipping point. For millions of people, the time has come for women priests. TIME Magazine rated Women Priests the #6 top story in 2010 . A growing number of priests, theologians as well as, bishops and a cardinal from Europe, Australia the United States and Latin America are calling for women priests. ---Over 250 German speaking theologians called for a dialogue on women in ministry thereby opening the door to women's ordination. ---Bishop Markus Buchel, bishop of the diocese of St. Gall in Switzerland spoke out openly for women's ordination on Easter Sunday/2011 in the parish paper. He said: "We must search for steps that lead there," "I could imagine that women's diaconate could be such a step. "Regarding priesthood for women, Büchel said, "We can pray that the Holy Spirit enables us to read the signs of the times." --- Bishop William Morris, from Australia, was forced to resign by the Vatican for wanting to discuss married priests and women priests as a possible response to the shortage of priests. --- Following the lead of Roy Bourgeois, more priests in the U.S., Europe and elsewhere are now choosing the living water of the Spirit and supporting the justice of gender equality. -- By the waters of our Baptism, we are all equals. --The grace of Spirit water flows through the world, and waves of liberation follow as women priests remind us that women are equal images of God, and are therefore worthy to preside at the altar. Join the mighty wave that is moving the church to partnership in a Christ-centered, Spirit-empowered community of equals. ---Jump in the water that is bringing new life, creativity and justice to the church and beyond. 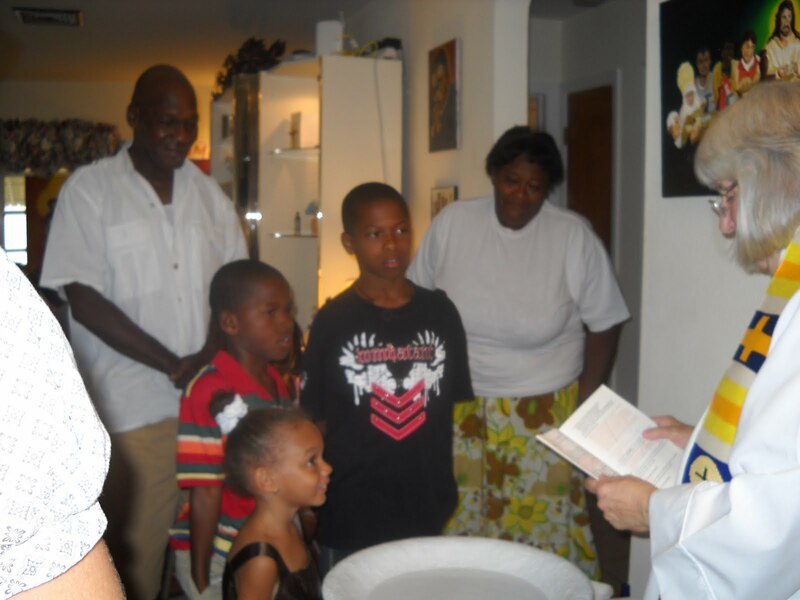 Help us promote Gospel equality in a renewed Roman Catholic Church now! "THE prospects of a visit by the Pope to Ireland next summer have receded , as the Government's relations with the Vatican sharply deteriorated. In his first comment on the Cloyne Report, Taoiseach Enda Kenny said it was "disgraceful" that the Vatican ignored child protection safeguards agreed by the Irish bishops. Mr Kenny's criticism was a prelude to the Papal Nuncio being summoned to Iveagh House, where Tanaiste and Foreign Affairs Minister Eamon Gilmore demanded an explanation for Rome's "inappropriate" intervention in Irish affairs. " Kudos to the Irish head of state, Enda Kenny and the current Irish government for holding the Vatican accountable for its outrageous disregard of child protection policies that its own bishops accepted. It is time that governments across the world do likewise. The Irish government should not allow the Vatican to hide behind diplomatic immunity, a flimsy excuse to get away with crimes against children. No church or religious group should be allowed to protect anyone who rapes, sodomizes or sexually abuses children by claiming canon law trumps civil law. "Their focus on the Congregation of Clergy's dismissal of the Irish bishops' 1996 Groundwork Document as "a mere study document" at loggerheads with canon law has put the Vatican in an indefensible position." The issue here is the Vatican's abuse of power and violation of the rights of children. It is outrageous that the Vatican did not even support its own bishops when they stepped up with such child protection policies. So much for a "pro-life" church that emphasizes fetal rights before birth, but fails to protect children and youth from sexual abuse by priests, covers up such abuse, and then blatenly downplays the seriousness of such crimes. The Vatican has lost its moral credibility. Jesus, Mary and all the saints would weep! Yes, by all means, cancel the papal visit. It would be an exercise in pomp that Ireland can ill afford either financially or spiritually. Send a message to the Pope. The protection of children, comes first, a papal visit at this time would be an exercise in hypocricy! Just thought I would share my ministerial experience of this past Thursday. Every year our hospital has a memorial service and invites the families (and friends) of all who have died in hospital to attend. 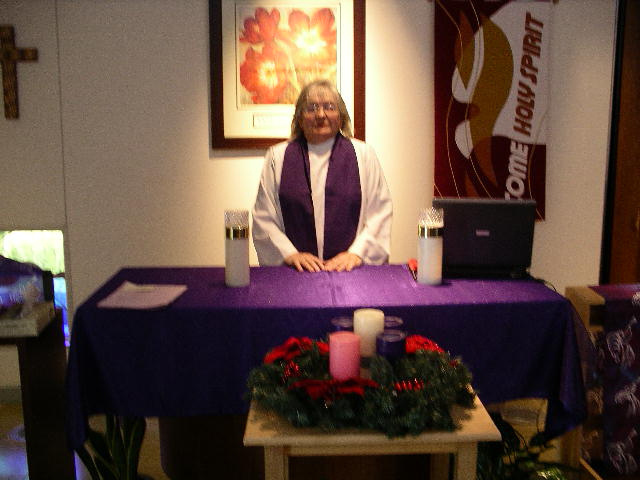 This year's service was held this past Thursday evening. I did not write the liturgical script, but I was asked to be a part of it. Chaplain Jerrye (our head chaplain who did write the script), Chaplain Gaye, Chaplain Cheryl (our intern), and I were all included. My role was to play "Amazing Grace" on the keyboard and to give the summary eulogy. I had not played a keyboard instrument since I left Alabama five years ago and I had never played one quite like that one! With only 20 minutes of practice time, I did not have time to figure out anything fancy. Everyone thought I did fine but I am certain any quasi-musician in the crowd probably noticed that I had trouble going from E flat to A flat. I guess after 5 years, ones fingers forget. And for the eulogy, the Spirit definitely guided me! Jerrye had written a basic eulogy and told me to add, change, or expand as I saw fit. I carefully wrote in some notes and then rewrote the eulogy on a separate piece of paper and stapled it to my copy of the master program. When we went down to the chapel, I was holding the music book and my master program was marking the "Amazing Grace" page. We set up the keyboard. I tried it out for a few minutes. Then I looked for my notes. They had completely disappeared!! The music book was there -- but not my notes. I know they were in the music book when we walked into the chapel. I never saw them again. The reason I know the Spirit was with me is that I had to ad lib the whole eulogy, trying to remember what Jerrye had written on the original and combining it with my memory of what I had added or modified. I know that I was not speaking. I asked to Spirit to give me the words -- and she did!! Everyone was very pleased with the eulogy. I am convinced that I said something that someone there needed to hear. I do not know what and I do not know who. Or maybe it was something in my notes that the Spirit did not want me to say! And my master program with notes never appeared! Monday, July 18, 2011 "There were no repercussions from the Vatican the many times that the Rev. Roy Bourgeois was arrested for trespassing at a U.S. Army facility where he protests human rights violations. But when he preached at an ordination Mass for a woman who claimed to become a Catholic priest, he was excommunicated...."To be very honest, I feel that, while I'm not in good standing with the Vatican, the Vatican is not God. I've never felt closer to God," he said. On Sunday he will be in Pittsburgh to receive the 21st Century Prophet Award from Call to Action-Pennsylvania, an organization of liberal Catholics that urges women's ordination and other changes in the church. While Father Bourgeois will not say Mass, Eucharist will be celebrated by Joan Houk of McCandless, a bishop in Roman Catholic Womenpriests, which sponsored the service that Father Bourgeois was excommunicated for participating ..."
Way to go, CTA. Mayknoll priest. 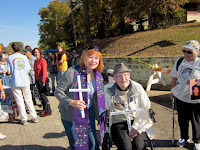 Roy Bourgeois is a prophet leading the way to justice in the church. He is unafraid as he often says to disturb the hornet's nest!! That he did when he preached at Janice Sevre-Duszynska's ordination in Lexington, Kentucky in August 2008. It was an awesome moment to stand around that altar with him and know that history was once against being made.I knew that he had crossed the line in the church and expected some sort of punishment, but excommunication and being pushed out of his order! Whoa! None of the pedophiles who raped and sodomized innocent children suffered such a fate! Like the prophets of old, he has been rejected by the religious leaders. At the end of the day, we must walk in our truth. Thank you, Fr. Roy, for reminding us of our prophetic call to do justice and live justice in our church and world. This is a cause worth living and dying for! 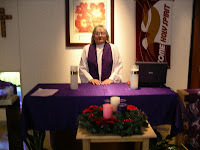 How appropriate that Bishop Joan Houk presided at the liturgy. On July 31, 2006, 12 women were ordained on the Majestic boat on the three rivers in Pittsburgh. Joan helped to organize these historic ordinations and it is a joy to see her celebrating this milestone in our history.